Recently, in Phys.org, they published a good overview of a couple of recently written genetic papers dealing with Native American ancestry. I particularly like this overview, because it’s written in plain English for the non-scientific reader. In a nutshell, there has been ongoing debate that has been unresolved surrounding whether or not there was one or more migrations into the Americas. These papers use these terms a little differently. They not only talk about entry into the Americas but also dispersion within the Americans, which really is a secondary topic and happened, obviously, after the initial entry event(s). 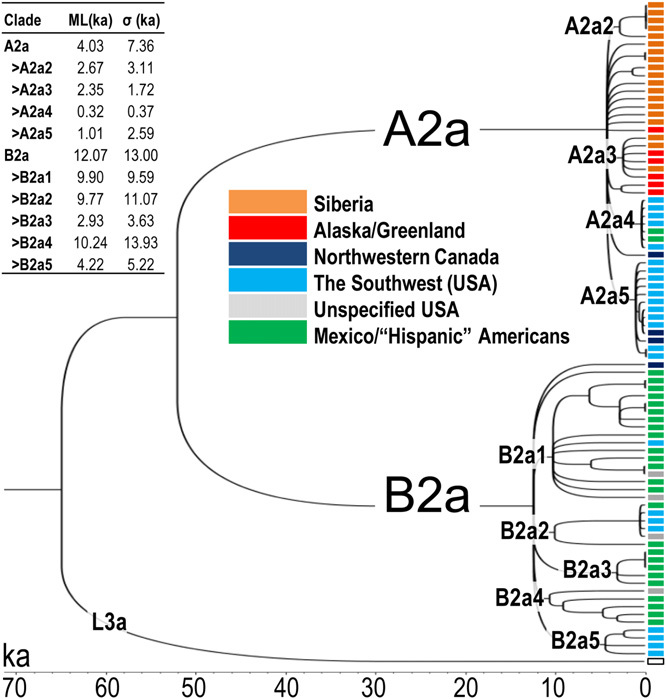 The primary graphic in this article, show below, from the PNAS article, shows the distribution within the Americas of Native American haplogroups A2a and B2a. As you can see, the locations of these haplogroups are quite different and the various distribution models set forth in the papers account for this difference in geography. One of the aspects of this paper, and the two academic papers on which it is based, that I find particularly encouraging is that the researchers are utilizing full sequence mitochondrial DNA, not just the HVR1 or HVR1+HVR2 regions which has all too often been done in the past. In all fairness, until rather recently, the expense of running the full sequence was quite high and there were few (if any) other results in the academic data bases to compare the results with. Now, the cost is quite reasonable, thanks in part to genetic genealogy and new technologies, and so the academic testing standards are changing. If you’ll note, Alessandro Achilli, one of the authors of these papers and others about Native Americans as well, also comments towards the end that full genome testing will be being utilized soon. I look forward to this new era of research, not only for Native Americans but for all of us searching for our roots. The original academic papers are found here and here. I encourage anyone with a serious interest in this topic to read these as well. This entry was posted in DNA, Migration. Bookmark the permalink. Can people of mixed heritage be defined by simply one or two haplotypes? As populations become more ethnically mixed, will the quantity of haplotypes simply increase? Intermixing does not affect the direct paternal line DNA or the direct maternal line DNA, because neither of those are mixed with the DNA from the other parent. It does affect the autosomal DNA which is that given to the child by both parents. I’ve explained the different kinds of DNA and how they work in this article.